If you're looking for an affordable set of earphones that looks cool and delivers decent sound quality, then you might want to check out this pair from Coloud! 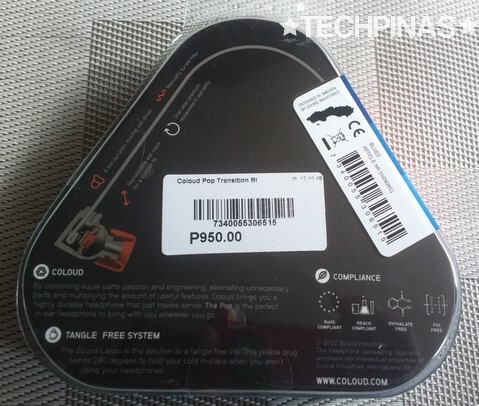 Priced at only Php 950, Coloud The Pop is the most affordable of the three earphone lines that the Swedish company currently offers in the Philippines. But apart from its low price tag, there are several other things about this product that make it truly noteworthy. That said, let me share with you the five things that attracted me to it. 1. Youthful Design - If you want earphones with generic designs that make them barely noticeable or fade in the background, then Coloud The Pop is not for you. 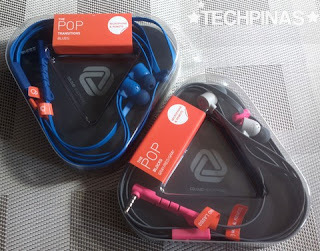 But if you're the type of user who wants his gizmos to be a reflection of his or her youthful, fun, unique, colorful, and outgoing personality, then you'd love The Pop's slightly quirky and totally eye-catching design highlighted by thick wires and earplugs that are distinctly Coloud. You wear this and you're sure to get "That looks nice. Can I borrow it?" often from your friends in school. 2. Fun and Vibrant Colors - Tired of plain black or white earphones? You can get The Pop in various cool color combinations like Yellow and Orange - Red, White, and Light Grey - Cyan, Teal, Pink, and Black - Pink, Light Grey, and Dark Grey - among many others! I have mine in Royal Blue and Sky Blue (Blues Combo) for the reason that I'm sure many of you already know. 3. 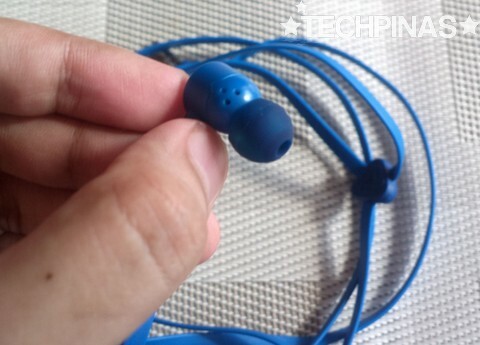 Noise Cancellation - The Pop comes with in-ear silicon earbuds that eliminate any audio pollution around you, allowing you to focus on your music. 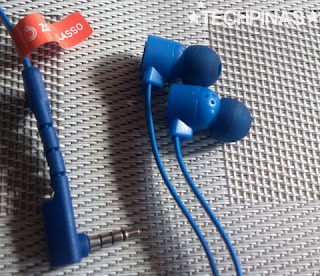 The package also comes with Small, Medium, and Large replacement caps so that the plugs will always sit securely in your ear. One downside, though, is that - even if you're wearing the size that's right for you - having these things plugged in your ear can feel a bit uncomfortable after a while. Nonetheless, they get the job done; I've been using The Pop earphones with Medium-sized buds for a few weeks now and I can really say that the noise cancellation that it offers is at par with what far more expensive earphones in my collection deliver. 4. 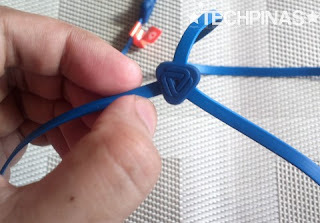 Tangle-Free System - As I mentioned in my Coloud The Boom review last February, the Swedish company made sure that users won't ever have to deal with hideous tangles by giving their earphones flat fetuccini-like wires that quite simply resist knotting! On top of that, Coloud even developed a unique system called Zound Lasso for neatly winding the wire, making it easy for you to keep your earphones in your bag together with other wired devices. 5. Crisp Treble, Powerful Bass - The Pop may be the smallest member of the Coloud family of earphones but when it comes to delivering bass, it's probably the most powerful of the bunch. Users get loud, chest-pounding (as opposed to punchy) bass that those who like RnB and Rock music will definitely appreciate. 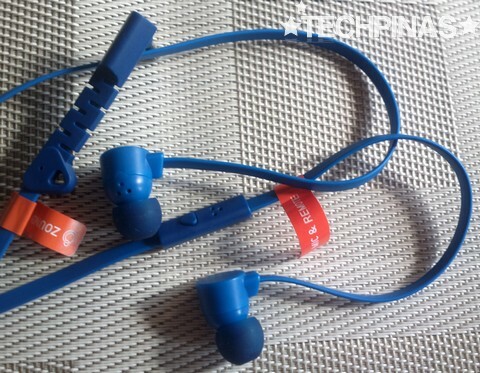 This big bass complemented by clear and crisp treble, which - while not the best you can get from an earphone - is good enough to give an enjoyable music listening experience. Verdict: I really think that young and young-at-heart music lovers won't find it hard to fall in love with The Pop. While the overall sound quality it delivers is fairly average, all the five things I mentioned above more than make for it. And come on - it's just Php 950, so let's not nitpick, shall we? If anything, I can honestly say The Pop - which is now available at all Beyond The Box outlets - will give you far more than what you'll pay for it. And so, all things considered, I give it 9.8 out of 10 TP Stars.